Neat project! I have been looking for a way to read encoders reliably, are you planing on sharing the arduino code? Thanks Dennis. Yes. I plan to share the code. I need to make a few mods first. I plan to install on my Mill in a few days so this should be the ultimate test. Peter. With this setup there is almost no high limit to the resolution of the linear encoder as long as its under 40 MHz in pulses correct? Hi, If I am reading the LS7366 datasheet correctly, the crystal frequency needs to be 4x max frequency of the ‘A’ quadrature output. In my case I am using a 20Mhz Crystal. (the max is 40Mhz for 5V operation. I used 20Mhz just in case I powered from 3V) With a 20Mhz crystal, the quadrature frequency is limited to 5Mhz. Since I get a 512 pulses per 2mm with the AS5311 encoders. The AS5311 has a limit of 650mm/s so at this speed the pulse frequency is 166.4Khz if my calculations are correct! Should be fast enough for my application. I guess it depends on what you plan to mount your encoders on….i.e. how fast it moves. The internal pulse counter is also limited to a 32bit number. Peter, really interesting project! I have a Taig lathe and recently purchased a CNC Taig mill. Would like to add digital readouts some day, so watching patiently. Thanks, matt. Thanks Matt, I’ll post more on the Taig mill setup once I have the display board mounted. I plan to do a small lathe version. I no longer have my Taig lathe but have a Unimat 4 about the same size. I will re-design the encoder boards (to make them smaller) for the small lathe version and make a 2 axis display board. 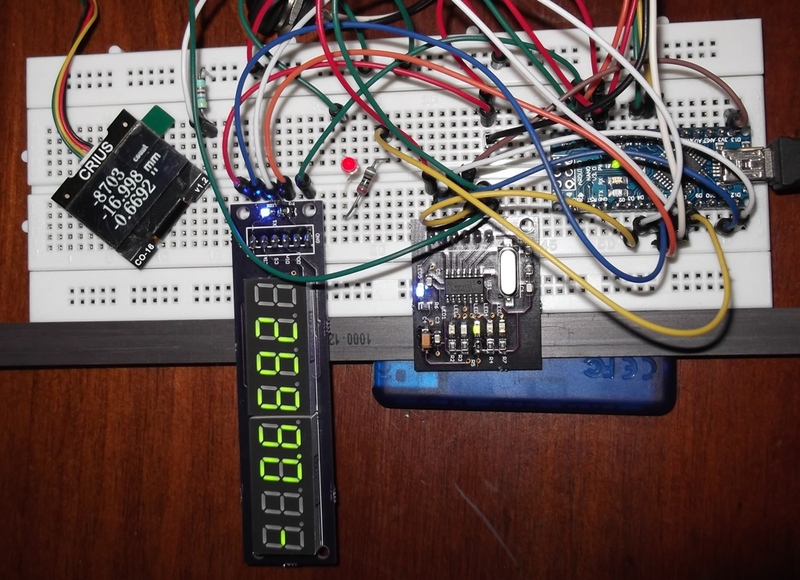 Most likely using a 2.2″ blue LED display. Peter. Hi Peter, Looks like you have made quite a bit of progress on this high-resolution readout (Prototype 3 looks great). Very exciting that you got successful results. What gap are you using between the sensor and the magnetic strip? I’ve read that this being as small as possible is critical. Either way, kudos on inspiring me to get started with this IC in the first place! Hi Thomas, According to the AS5311 specs, the gap should be less than half the pole width. In this case using 1mm pitch magnetic strip, so gap should be less than 0.5mm. When I mounted my encoders I just made sure I could see a gap between the encoder and tape but as close as possible. The biggest problem is keeping the strip protected against anything that may get between the encoder and strip. This is why I have mounted my strips in ‘U’ shaped aluminium extrusion. Depends on you application I guess. I plan to make the code available once I have ‘refined’ it a little more. Reading the encoders is quite easy. I had more problems driving the OLED display. I have built a few more versions of or this DROs since these posts and plan to post some updates shortly.